Apparently after posting every single day the week before last I was slightly burned out, hence no post at all last week! We also had Jan’s dad staying this weekend so there wasn’t really time for the blogosphere. I promise to come and read everyone’s blogs soon though! The red tower in the last picture is part of the town hall (Rathaus) and the interesting looking roof at the front is the Museum der Kulturen (Museum of Cultures). It was nice to see the roof of the cathedral up close – I think it’s really pretty! And once again I was left thinking “Wow, I actually live here!”. The two towers of Basel Cathedral – Georgsturm and Martinsturm – can be climbed any time that the cathedral is open for a fee of 5 francs (payable at the information desk). Grr, I should be able to use my camera by now! There isn’t really a great deal to do in Laufen itself so you couldn’t really spend a whole day there, but various hiking routes pass by, start or end there – for example, you could start in Flüh and finish in Laufen, ending your afternoon of hiking with a look around Laufen’s old town followed by a meal. On New Year’s Day, it actually stopped raining for a change (although it was cloudy), so after a large brunch we decided to take our friends out for a walk. First, we went to Bottmingen, a fairly nondescript small town just outside Basel, but which has a castle (not really a castle as such, although that’s what it’s called. It’s more of a huge house, surrounded by water. It’s now an expensive restaurant). I took photos of it from every angle – it seemed to deserve it! No, I don’t know either! Maybe left over from Halloween? Those photos were the best I could get – it wasn’t all that keen on coming to say hello (probably because there were 9 of us!). Jan and I then decided that we should continue our walk by going to a water tower that’s on a hill above Basel, called Bruderholz. For the price of one Swiss franc, you can climb the tower and see Basel and its surroundings. It was cold and windy at the top, and by the time we had walked back home we were all ready for a nice cup of tea! It was worth it though, for the fresh air and the view. On arriving in Bern, we first walked to Bundesplatz to see the Bundeshaus, or Federal Palace – the place Switzerland is governed from. Here’s a photo of the front of the Bundeshaus. The market is a normal one, not a Christmas one. According to a local legend, Berchtold V, Duke of Zähringen, who founded Bern, vowed to name the city after the first animal he met on the hunt. Said animal turned out to be a bear. Obviously this isn’t true, but the bear has been the heraldic animal of Bern since the 1220s and appears on the coat of arms. There are various bears all around the city, and even some real live ones in the Bärengraben (bear pit) at the eastern edge of the old town. We didn’t get to see any live ones though – the weather may have been incredibly mild for December, but bears’ body clocks aren’t affected by the temperature and they were all hibernating. After a bit more wandering around, we eventually came to Waisenplatz and the first of the Christmas markets. Of course, we claimed our free Glühwein – who cares that it was far too warm for hot drinks? Free is free! Next to the Münster was the next Christmas market. We had a look round all the stalls before deciding it was about time for food. I had a hamburger with garlic sauce and Jan had a sausage. I didn’t really take any photos of the market, so the next few are mainly of the Cathedral and things on the square. We did also go inside, but no photos were allowed in there – even without the flash! After eating, we had our Glühwein cups refilled – this time with white Glühwein -drank up, then continued walking round Bern. We were trying to find somewhere to eat that evening but everywhere was fully booked! Eventually we decided to head back to Basel and eat there, but not before passing by the Münsterplatz Christmas market again, where the lights above the archways were now on! Bern was my 5th Christmas market that I’m willing to count towards the list (my “home” market doesn’t count! ), and marked the achievement of that goal for my 35 before 35! 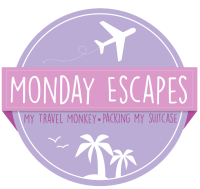 I’m linking this post up with Monday Escapes. Click the button to see where everyone else is virtually escaping to this week!